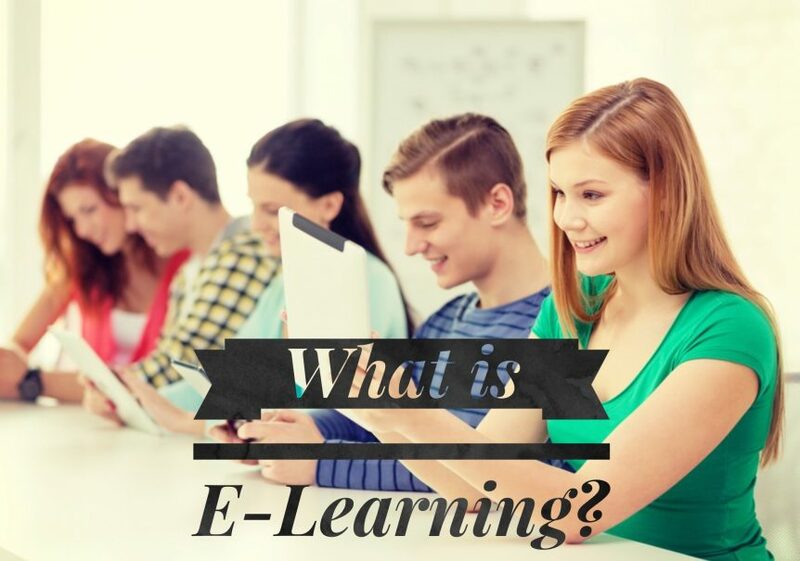 What is e-learning – this is a question that should be easy to answer. The “e” is for electronic after all, so it is any sort of learning that is delivered electronically, right? For me, that isn’t really true. After all, a DVD is a method of electronic delivery, but courses delivered on DVD are not e-learning in the modern sense of the term. E-learning has evolved considerably beyond the simple use of electronic delivery. Maybe a better question is: what is e-learning today? I consider e-learning to be both about how learning is delivered (i.e. electronically), and the educational practices used to make it effective. Let’s go into those two things in a bit more detail before outlining the main concerns and benefits of e-learning. In simple terms, e-learning is learning that uses technology instead of a classroom. In other words, it is a way of delivering a lesson, training, or course using a computer or mobile device. It is used in place of or in addition to classroom-based learning. In the past, an e-learning course would have existed on a CD-ROM or another type of storage device. Today it is much more likely to be delivered over the internet. E-learning courses and modules are also often available on the internal networks of companies. They are typically created and managed using a learning management system (LMS). In some situations, e-learning is instructor-led. This is known as synchronous e-learning and follows similar learning processes to traditional classroom-based learning. In fact, you can even include live virtual classroom situations as part of an e-learning course. In other situations, e-learning courses are designed so the learner goes through the course at their own pace. This is known as asynchronous e-learning. It has become increasingly popular with the growing use of mobile phones and the delivery of e-learning courses on mobile devices. As learners are no longer tied to a classroom or a computer, they can learn at a time that best suits them. As e-learning is delivered on computers and phones, it is multimedia. This means it can include images, video, and sound as well as text. The technology behind e-learning makes it possible to use a number of educational practices to make the courses more effective. One of the best examples of this is the interactive nature of most e-learning courses. Interactive elements encourage user participation and promote active learning. It also ensures concepts are grasped and progress is made before a learner moves to the next stage. Repetition – to improve knowledge retention. Practice – to give the subject being learned context, and to make it more relevant to the learner. Learner feedback – allows the learner to monitor their own progress and see what areas still need to be worked on. This information is also available to course designers. Micro-learning – learners often prefer micro-learning learning over long-form learning, and it typically delivers better results. Let’s start with the concerns. One of the main hesitations I hear is the removal of the human element of learning and the effect of this on learners. This is something you can easily overcome, however, by using video and audio. In addition, you can also use e-learning to complement classroom-based learning. Another concern I sometimes hear is that learners will just go through the motions. In other words, simply clicking next to get through the course without taking it in. You can overcome this by building in tests and quizzes that prevent progress until the content is properly grasped. The practical applications for e-learning are diverse. It is suitable for every industry and almost any type of course. This is the main reason it is becoming such an important part of the educational process for businesses, colleges, and other organizations.